Chester girls’ basketball and the Greenville Indian girls have had two amazing games challenging each other on the courts. On Dec. 11, the Volcano girls came out on top beating Greenville 59-41. This was after a Dec. 1 game when the two teams faced each other during the Greenville Invitational Tournament where the Indians came out on top … 59-41! The neighboring teams met each other on the court for the first time in the season during the annual tournament hosted by the Indians on Dec. 1. It was a big weekend for the GHS girls as they won and won and won. Leading the scoring for the Greenville girls as they faced the CHS team was sophomore Alexis Goodson with 19 points. Junior Ashlyn Bustamante added 17 points to the scoreboard, sophomore Lacie Banchio racked up 10 points and senior Rylie Botts scored 9. Teammate senior Mackenzie Brown and sophomore Julieanna Fieldson also scored. Bustamante landed a 3-pointer in the mix and hit eight out of 10 of her free throw opportunities, 80 percent! Fieldson, Botts and Goodson also scored on free throw shots. Goodson managed to clean up 15 rebounds, Botts gathered 10, Bustamante six, Brown and Banchio grabbed five each and junior Solai Pomtong picked up two. Seventeen personal fouls were credited to the Indians during this game. Four each were to Botts and Bustamante, three for Goodson and two each for Brown, Banchio and Pomtong. 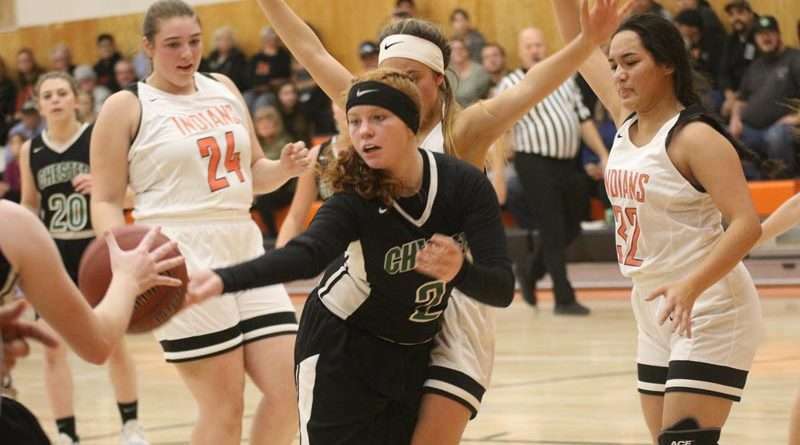 A larger GHS Indian team played the court as a rematch battle with the Volcanoes took place again in Greenville on Dec. 11. The quarter scores were GHS taking the lead the first period 12-10. Chester came back to outscore the Indians by 8 points ending the half with a CHS lead of 28-22. Chester continued after the half with a full head of steam scoring 17 points to GHS’ 8, ending the third quarter 45-30. Greenville stayed strong to add 11 points, but were unable to generate enough push to best the Vols. Chester didn’t need it, but added 14 to secure the win firmly for Chester. Scoring for Greenville was led by Mackenzie Brown with 10 points. Alexis Goodson scored 9 points and Ashlyn Bustamante added 8. Freshman Ashlyn Heard, Lacie Banchio and Solai Pomtong also scored for the Indians. From the free throw line, Bustamante hit four of her five shots, Brown also hit four and Goodson scored on one. Rylie Botts was fired up for Greenville picking up 13 rebounds. Goodson gathered eight, Brown seven and Bustamante five. Heard, freshman Nevaeh Lee, Banchio and Pomtong also picked up rebounds for GHS. Greenville increased the amount of personal fouls as it increased team members. Bustamante, Goodson and Botts all picked up five fouls. Brown was credited with three and Lee and Banchio each received two. No individual stats were posted for the Chester girls team.